The LEGO® SERIOUS PLAY® methodology is a radical, innovative, experiential process designed to enhance business performance. It is based on the belief that everyone can contribute to the discussion, the decisions and the outcome. The use of MTa in developing teams has been used for over 30 years. 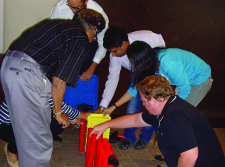 These unique, robust, creative and innovative experiential learning activities really challenge and push the boundaries in a safe and fun environment.